Hi Robert, what do you mean by “replace”? Move your mouse to the top of the screen so that the panel appears, right click, then select Customize Panel and uncheck Autohide. I deleted the shortcuts on my top panel (Firefox) How do I replace them? They don´t list it in the ¨Add Items to the Panel¨ menu. On a second note, when I try to use the ´ key, I have to press it twice, even when shifting, the ` is the same way too. 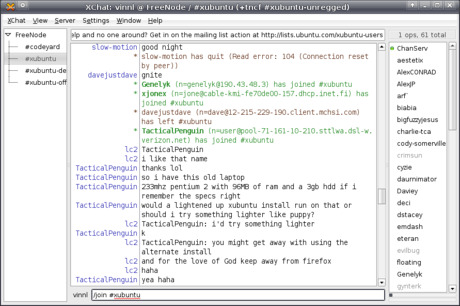 @Jason – as mentioned above, there are better ways of getting help with Xubuntu than asking here. However, the shortcuts on your panel are Launchers, the top item in the “Add Items to the Panel”-menu. As for having to press the ‘-key twice – you have probably set your keyboard layout to use dead keys. You can change your keyboard layout to one without dead keys (which allow you to e.g. press ‘ and then e to type an é) under the Layouts tab in the Keyboard settings from the Settings Manager. hello everyone.i have just started using xubuntu.i want few softwares from add /remove program but i am not able to connect internet using xubuntu.is there a way by which i can download those softwares using windows and then try to install it to xubuntu? if my question is really stupid for u to answer…kindly do not answer anything.i am new to this and i know this fact. Nirav, you can download the applications (.deb files) from packages.ubuntu.com and then save it onto a removable drive. Open them in Xubuntu to install them.